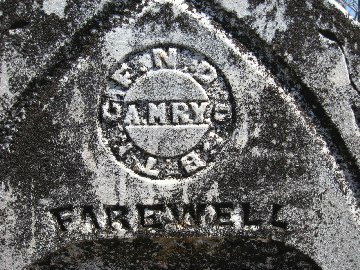 This Masonic FNDOZBTKC-AMRY image appears on my G-G-Grandmother's headstone located in Wesley Chapel Cemetery in Bluffdale, Texas. FNDOZBTKC-AMRY - This was a degree which was conferred in the United States upon the wives, daughters, mothers or sisters of Freemasons, along with a special, secret mode of recognition. It was used predominantly in the southern states, between the 1850s through the early 1900s. "FNDOZBTKC" refers to the biblical verse, from the book of John 12:15,..."Fear Not Daughter of Zion, Behold, The King Cometh." "AMRY" is an anagram for Mary. Thank you for sending in this Masonic headstone photo, Clyde. I hope this helps you to better understand the meaning of FNDOZBTKC-AMRY.